Walt Disney was an avid animal love, so it is no wonder that the writings of Paul Annixter would go one to inspire one of his films. Paul and his wife Jane primarily wrote books for young readers that were centered around animals. His novel Swiftwater about a Vermont family's struggle to rescue migrating geese from hunters serves as the inspiration for this film. The screenplay was adapted by Louis Pelletier, who previously penned Big Red for Disney. Norman Tokar was hired to direct, who had also worked on other Disney animal films like Big Red, Savage Sam and A Tiger Walks. His chief concern with the film was to create an atmosphere and mood. Disney star Brian Keith (The Parent Trap, Savage Sam) headlines the film as Cam Calloway. Vera Miles is paired with Brian Keith again after working together on A Tiger Walks. Young Western star Brandon De Wilde plays their son in his only film for Disney. Linda Evans plays his love interest in one of her earliest films. A young Tom Skerritt, most famous for his role in Top Gun, has a small role in this, one of his earliest films. Walter Brennan has a supporting role in his first of two Disney films. And Disney favorite Ed Wynn also has a supporting role. While some establishing shots were done in Vermont, the majority of the film was shot on the Disney Studio lot. The entire village plus a lake and the family's cabin were built on the backlot. Since the film takes place in the fall, artists painted 280,000 leaves on the lot to make Burbank look like fall in Vermont. Famous composer Max Steiner (Gone With the Wind and Casablanca) wrote the score, the last film he composed before retiring. The Sherman Brothers also wrote two songs for the film called "The Cabin-Raising Song" and "Rhyme-Around." The film begins with footage of geese as the credits play and we are introduced to the cottage of the Calloways. The son Bucky gets in a fight with a man in the town who is shooting at the geese as they fly over. When he gets home, his father tries to teach him how to fight. When a rich business man sees the geese and hears that they fly over Swiftwater on their way South and North, he tells the town it would be good business to make it a tourist destination for hunters. When Mr. Calloway finds out what the town is up to he is outraged. He takes a loan to buy the lake property that the town was planning to turn into a stop for the geese. Their main source of income is selling furs. When the market crashes and they make less then expected for their sales, he gets in over his head and can’t pay back the loan. They are evicted from their cottage and they move onto the new property where they build a bigger cabin. They are approached one day by a man claiming to be a photographer who gets them some money to plant corn to lure the geese in the fall for photographs. However, he is actually the business man that came to town earlier and is interested in hunting the birds. An altercation ensues and he gets shot. Thankfully, he is ok and in the end the geese are safe too. 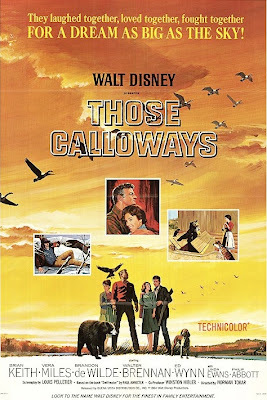 Those Calloways was released on January 28th, 1965. Critics were very mixed on it. Those that wrote favorable reviews talked about the way the film made them feel, which was really the directors intent. Those that didn't like it found it too simple and drawn out. It didn't do very well at the box office and made its television debut in 1969. It made its home video debut in 1985. It's easy to understand why critics were so torn on this film. It has some really great moments. There is some humor, mostly involving Mrs. Calloway trying to shoe a bear away that always comes to their cottage. There are also some truly touching moments, like when she is presented with her first fur coat for Christmas. All of the actors give fine performances and Swiftwater feels like it would be a great place to visit, which adds to the films appeal. On the other hand, a story about a family who loses everything to save some geese doesn't seem very justifiable and with a two hour runtime, its easy to see why so many were quick to dismiss it. It's a slow paced film full of sentiment for a simpler time that doesn't exist anymore. If you enjoy that kind of film, you will probably be amongst those who truly love Those Calloways. I enjoyed the film, but I wouldn't go as far as to say its one of Disney's best. 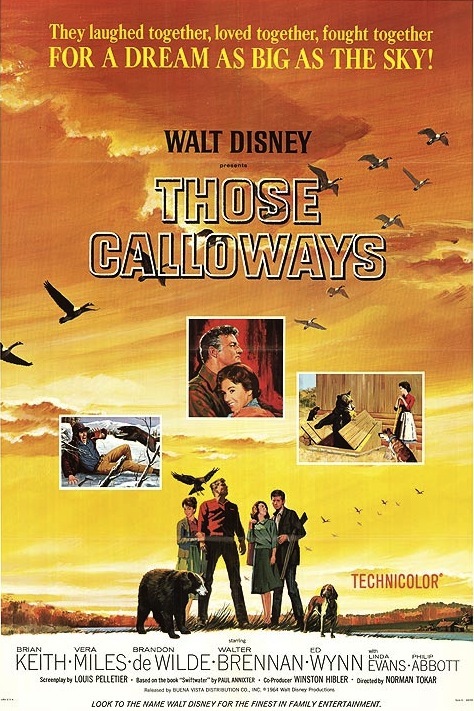 Those Calloways is currently available on DVD. A minor restoration has been done, but the print is still flawed by excess grain and artifacts that shouldn't be there. The film is presented in a widescreen aspect ratio of 1.66:1. While theater exhibition guides didn't specify which aspect ratio was correct, most Disney films from this era were presented in 1.75:1. However, 1.66:1 is pretty close and is much more preferred than Disney's usual fullscreen transfers. There aren't any bonus features. The film is also available on iTunes where it can be purchased in HD widescreen. can u please email me..i have some questions i want to ask you about several Disney dvd releases!